In Qt 4 lifetime it was possible to accelerate QPainter drawing with OpenGL by using the QGLPixelBuffer class: it offered a nice and quick way of creating a drawable surface, rendering to it (using ordinary QPainter methods) and grabbing the final result as a QImage. 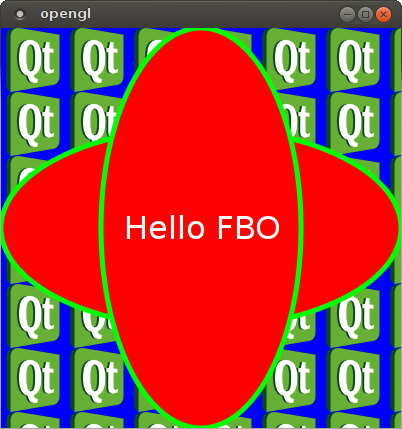 In Qt 5 QGLPixelBuffer is still there, but it has been deprecated in favour of Framebuffer Objects, wrapped in Qt by the QOpenGLFramebufferObject class. 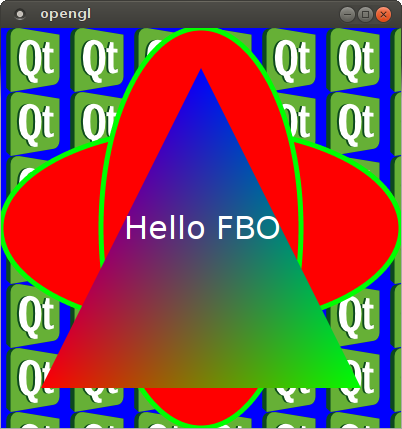 However, QOpenGLFramebufferObject is not a QPaintDevice, therefore we can’t use a QPainter directly on it. QOpenGLPaintDevice is the glue we’re looking for. Creating a QOpenGLPaintDevice on an active OpenGL context allows us to paint using QPainter on it. Let’s have a look at some code. This small piece of code creates a QImage by painting on a temporary Frame Buffer Object using QPainter, then displays the resulting image using a QLabel. Let’s analyze what the createImageWithFBO method does. First of all, we create a QWindow (of type OpenGL) and a QOpenGLContext, and make the context current on that window. Both of them will try to use a OpenGL 3.3 (note that f.i. Mac OS X as of now supports up to 3.2). Using QWindow as the context’s target surface is a workaround because, as of Qt 5.0, there are no other QSurface types. Since we need a valid surface to make a context current, we just create an invisible window (we won’t show it) without any specific size, and that is sufficient to be able to use an OpenGL context on it. These variables will hold our target rectangle/size to draw on. Here we’re creating a QOpenGLFramebufferObject with the target size. Before doing that, we also specify its format: we want multisampling to be active on the FBO, so we get antialiased primitives, so we set 16 samples per pixel; moreover, we ask Qt to attach a depth and a stencil buffers to the frame buffer object. We’re not going to use any of them explicitely; but the Qt paint engine might (actually, there are glStencil calls in the paint engine), so we want the FBO to have them. Last, we bind the QOpenGLFramebufferObject object. This will redirect all painting operations on it. We then proceed to create a QOpenGLPaintDevice and painting on it using the ordinary QPainter calls. Note that we explicitely have to end() the painting, so we know that all painting commands have been flushed (and done) after that call, and our FBO holds the results. And these lines complete the magic: we unbind the FBO, returning to the default framebuffer, and grab its contents as a QImage using the toImage() method.
" gl_Position = vec4(position, 1.0);\n"
"    color = vec4(fragColor, 1.0);\n"
Which is a very verbose (but modern) way to draw a three-coloured triangle in the middle of our image. I won’t analyze the snippet in detail, as it’s quite readable: in the first part we’re creating a couple of vertex buffer objects, one to hold the vertex positions (already in clip space) and another to hold the vertex colours (in RGB). We then create the required vertex and fragment shaders, which are trivial — the vertex shader just outputs the (normalized) position in input, and passes the colour to the fragment shader; the fragment shader simply outputs the fragment colour it got as input. The program is then linked, and the buffers created at the beginning are then set as attribute buffers. The work for this blog post has been kindly sponsored by KDAB, the Qt experts. This entry was posted on February 10, 2013 at 01:54 and is filed under Qt. You can follow any responses to this entry through the RSS 2.0 feed. Both comments and pings are currently closed.